Permanent licence - no hidden licence fees. Huge capacity - BooksIndex+ will cope easily as the library grows. Efficient cataloguing to international MARC standards. Powerful, free-text search facility, with full range of Boolean operators. Search presented with code and full view. Integration with a variety of authentication systems. Web access for intranets and the internet. Data import from legacy systems. XML export/import, optional Z39.50, SRW/U or OAI gateways. 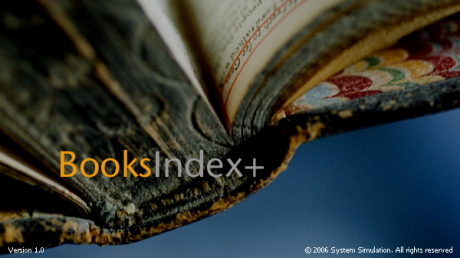 BooksIndex+ is a system that provides for the management of book collections. It is available in a stand-alone configuration or as a module in CollectionsIndex+, System Simulation's software for managing the range of collections held by cultural institutions - books, objects, archives and images. BooksIndex+ is considerably easier to use than many traditional library cataloguing systems. Straightforward MARC data entry is available for those who are familiar with library cataloguing, but the system also supports staff that have not been trained in the MARC system. This approach is also carried over into the presentation of search results, where there is a choice in the way that data is viewed. BooksIndex+ is an easy-to-use system that provides effective support to the cataloguing of book collections in a range of different institutional circumstances. When integrated into the full CollectionsIndex+ range it also allows direct cross-referencing to images, archives and object catalogues, held in parallel collections management systems. For those that are fully familiar with the MARC system, traditional cataloguing and retrieval are available, using MARC tags. For those who are not as familiar with the details of MARC, assistance is given at the tag and subfield level with labels that identify the meaning of the corresponding codes. Similarly, as well as a code view of search results, a 'full view' presents the record information within a framework showing the meaning of codes. The user interface of BooksIndex+ is a Windows desktop application. Behind the intuitive user interfaces, BooksIndex+ makes good use of System Simulation's well-proven database technology and terminology systems. Powerful search facilities range from free-text to highly structured searching, while other approaches allow, for instance, a previous search logged in search history to be modified and made more specific. Access to the data on the collection can be provided through the network, through intranet and internet systems or through a Z39.50, SRW/U or OAI gateway. The package includes all licences (perpetual), a 90 day warranty, documentation and training. Support, maintenance and escrow arrangements can be agreed.